I had my first harvest of the season today. A pretty little head of red butterhead lettuce, some kalelette sprouts, and a handful of big spinach leaves. Delicious. I bought a batch of 15 mixed layers from McMurray Hatchery. They say they are a mix of at least 5 good laying types plus one exotic layer. I can see that the single fancy bird is silver and has very pretty feathers. I don't know any of the breeds. 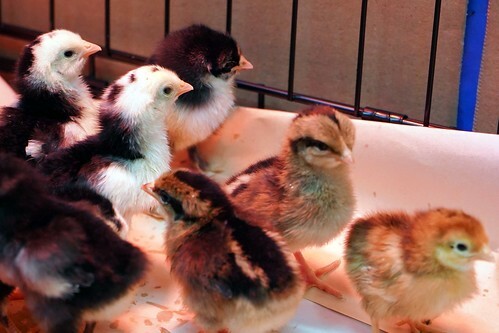 If anyone can tell the breed from looking at a chick and you recognize any of these - let me know!! They are two days old now and are being very good. 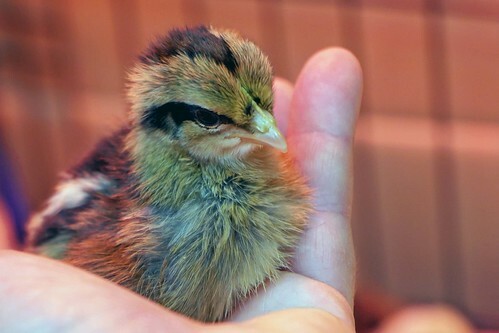 There was one chick who kept pecking other chicks' eyes yesterday. (She the black blur in the left front of the bottom photo.) Over and over. She spent the night in solitary (the shipping box under the light). She's being good today. Then there is one very tiny bird that I'm hoping will thrive. (She's that buff one at the upper right of the bottom photo.) She has a hard time pushing her way in to the food. I'm spreading crumbles now and then to see if that helps. 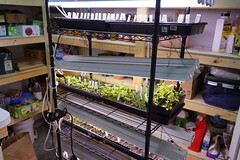 In have both of my red heat lights over the crate now my to keep the temperature up at 95 degrees for a week. Next week when they are OK at 85 I can separate any tiny birds and move the second light to a smaller crate. My plan is to only keep 4 or 5 of the chicks. I have one adult hen laying in my coop outside (with another adult that I am overwintering for someone else). I should limit myself to 4 and 5 is pretty full for my small coop. Five others have been spoken for. If you're local to Lincoln MA and want any let me know. I'll advertise on Craig's list at some point. Charley is very interested in watching the chicks, Suzie less so. Charley always follows me to go check on them. The chicks are in a very secure crate! 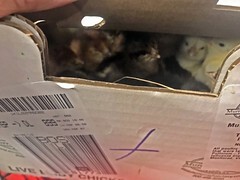 I got a box full of one-day-old baby chicks in the mail today. 17 of them! They are very tiny and very cute. 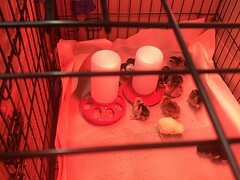 They are now under a red heat lamp in a dog crate converted into a chick incubator. 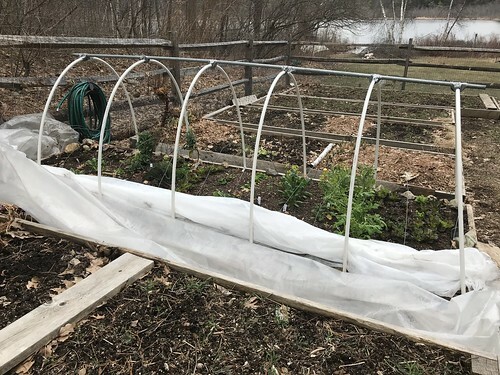 Whenever we get a couple days with night temperatures above freezing I open up my winter bed. 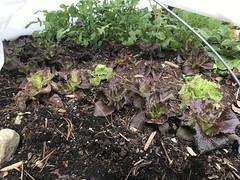 It's not as full as last year since I planted late in the fall, but there are lots of greens coming along. 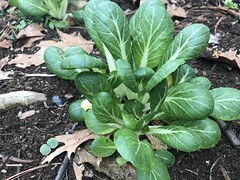 Spinach, lettuce, bok choy, and cabbage. 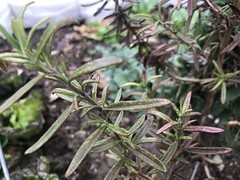 Some overwintered rosemary. 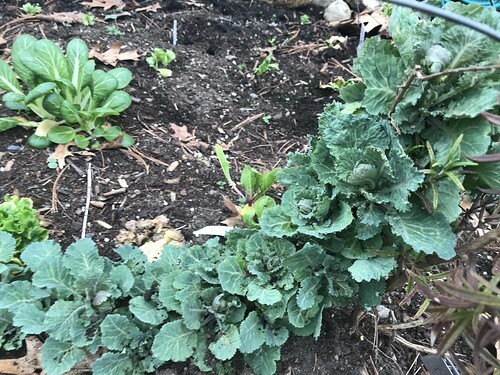 I was impressed with my kalettes that didn't mature last year, but look good now. The first day of spring - one of my favorite days! 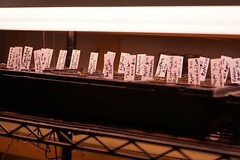 I have 8 trays of seedlings planted so far. Some are doing very well. 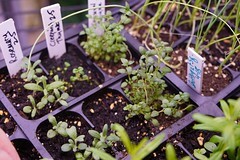 A tray of wild flower seeds I collected are taking their time to sprout. No problem. Sometimes these take 30 days or so. I am working on planting my tomato seeds now. A few days late now for me. I have the pots clean and set in trays. I’ve pulled out the seed packets I'll plant. Maybe I'll have time to plant tomorrow morning. Tomorrow I'll pick my up mother at the airport marking the end of her winter in Florida. She's looking forward to returning north. 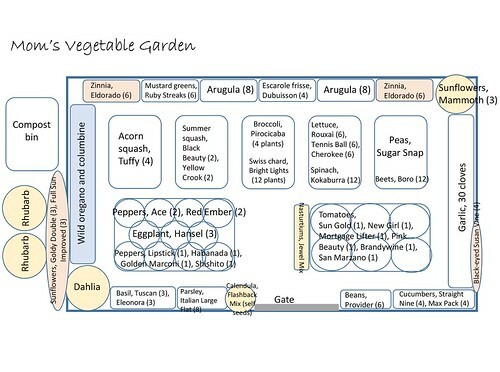 I've planned her vegetable garden and have several new ideas to try out to improve her garden this year. Her biggest challenge is tomatoes. I have an idea that the very high phosphorus level in her soil is affecting these plants. My dad liked to add super phosphate, but it eventually accumulates if you aren't testing the soil as you go. 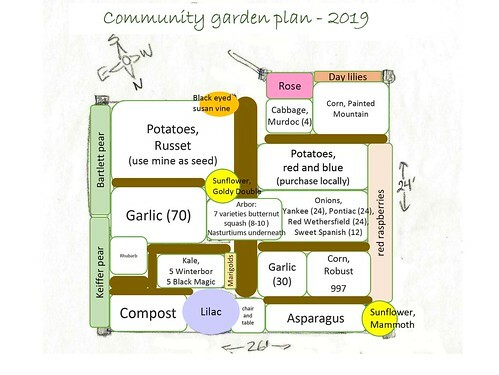 I'm looking forward to the growing season. 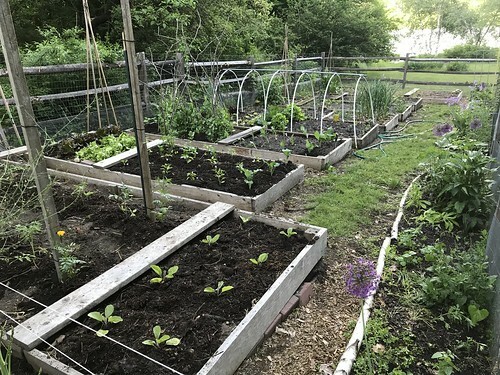 I'm planting way too many varieties of vegetable seeds this year. Last year, I cut back on different varieties and planted only my favorites. This year, the opposite. 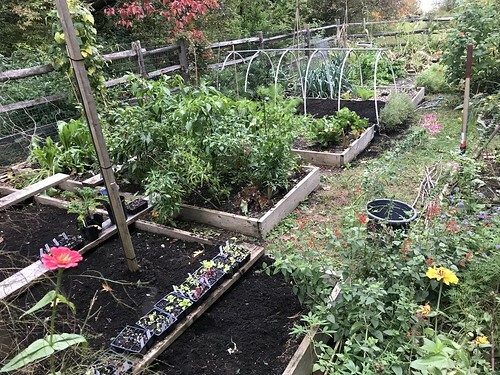 I'm planting a few plants each of many different varieties. I have a big Excel list to keep track of them all. 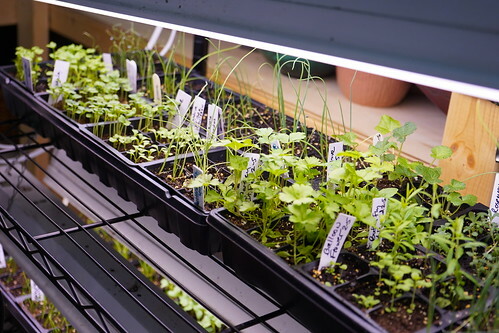 Feb 23: lots of onion varieties, also celeriac and parsley. 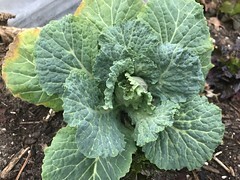 March 4: 11 cabbage varieties, also escarole and endive. and 15 varieties of peppers. March 19: radicchio, broccoli and lots of sweet peas. 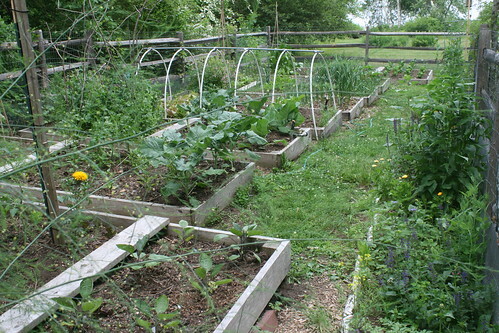 I hope to get my peas planted in the garden soon. As soon as the mud dries up a little more. 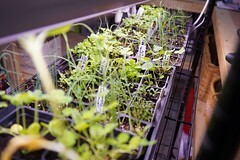 The next indoor planting is cucumbers around April 10. 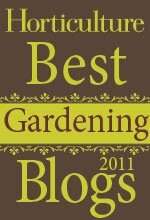 I'll add to this list as I continue planting. 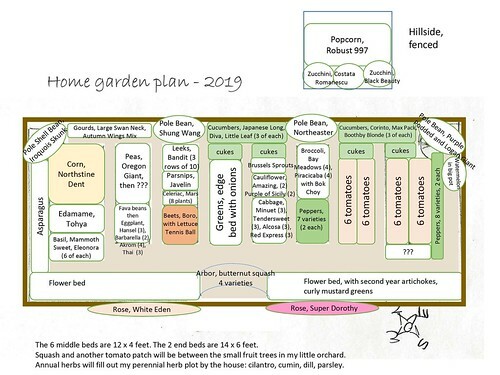 And finally, here’s how I keep track of what to plant when: Skippy's Calendar App. I also looked at the site Journey North, a citizen reporting site. These dates fit with their observations. Some springs are late, some early. This looks like a pretty average one based on the blackbirds. Today is the first page of a 365 page new book, a 365 day new garden season. A new slate, fresh soil, new plans to make. May all your New Years dreams come true. 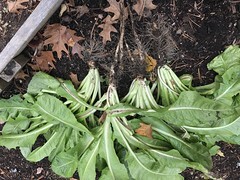 - From my home garden I harvested some kale and bulb fennel, dug up 3 first year artichoke plants for overwintering in pots in the garage, and dug 4 or 5 Belgian endive plants and set them out to cure under several layers of row cover. 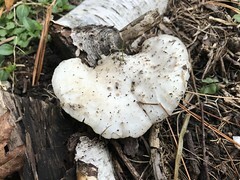 - I photographed 3 types of mushrooms growing in my home garden. One on untreated pine raised bed wood, and two on birch logs that edge my flower bed. I'll get these identified by an expert. 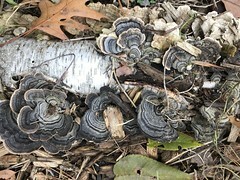 I THINK two are edible, one possibly a turkey tail and another maybe an oyster mushroom. I have no idea what the third is. 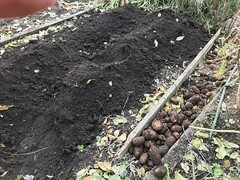 - I unpacked 4 or 5 of the 10 or so micronutrients that I am collecting mail order to refurbish the soil of my small orchard (3 apple trees, a cherry and a peach). 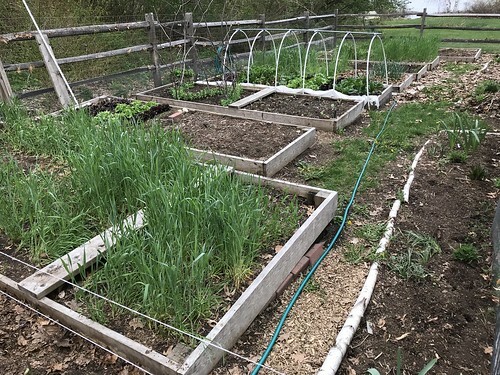 May 4: The peas are a few inches high, cover crop of winter rye is tall in some beds, and winter beds have greens growing. May 11: I just turned under the winter rye, crabapples and tulips are in bloom. 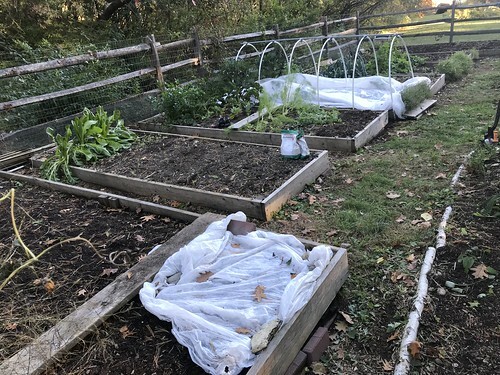 May 30: I just planted tomatoes, eggplants, and peppers. Alliums are blooming. 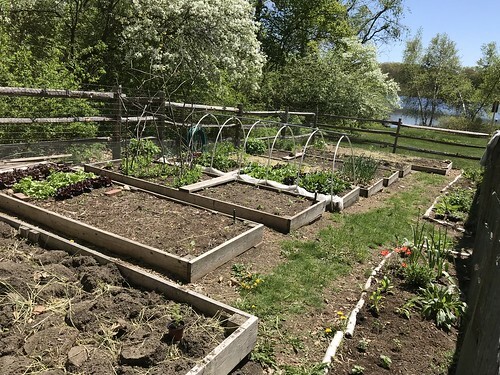 June 18: Everything is growing, including the weeds in the paths. 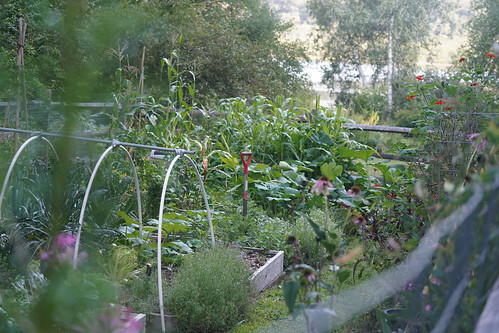 Those are asparagus fronds across the view in the foreground. August 24: Time for eating fresh vegetables! 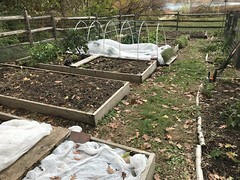 October 15: Beds with summer crops are cleared and ready for planting with some small seedlings to overwinter. 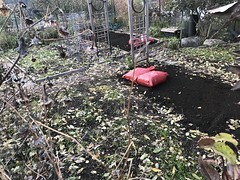 October 21: Overwintering beds are covered with a single layer of fabric. Soon I'll add a layer of greenhouse plastic.